Walk around the edges of your yard and you might see it. 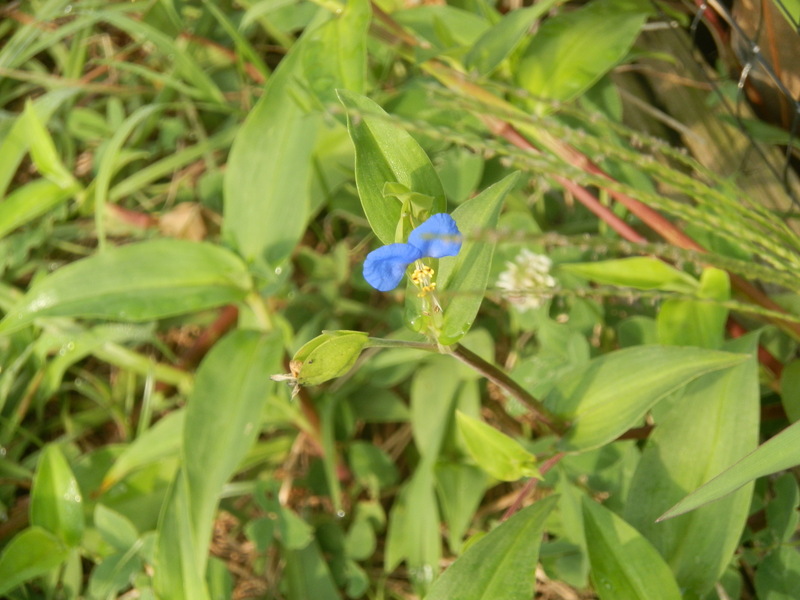 Dayflower is that grass-like weed with the little blue flowers. It finds its way into our flowerbeds and goes unnoticed, hiding itself under the cover of larger plants until those two big blue petals jump out at us. There is also a small white petal that often goes unnoticed. Each flower only lasts for one day. 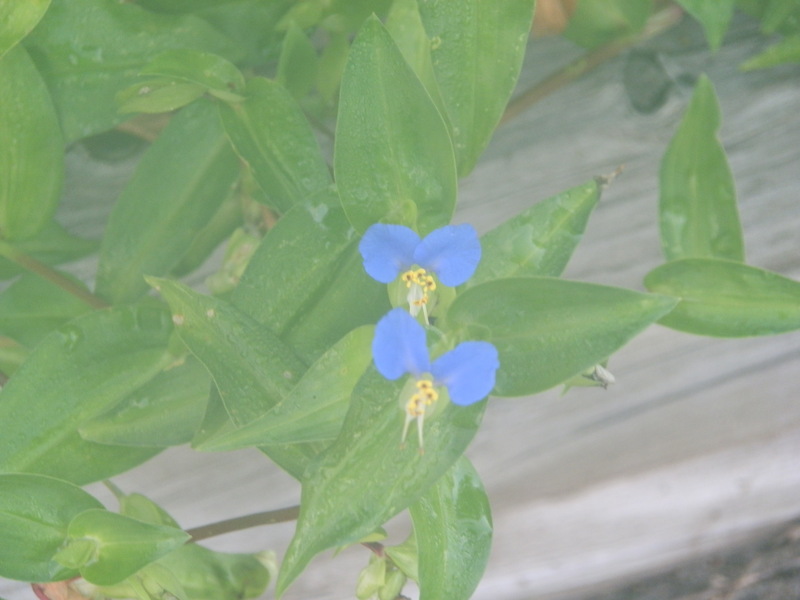 Originally introduced from Asia, common dayflower looks a little like a green Wandering Jew. 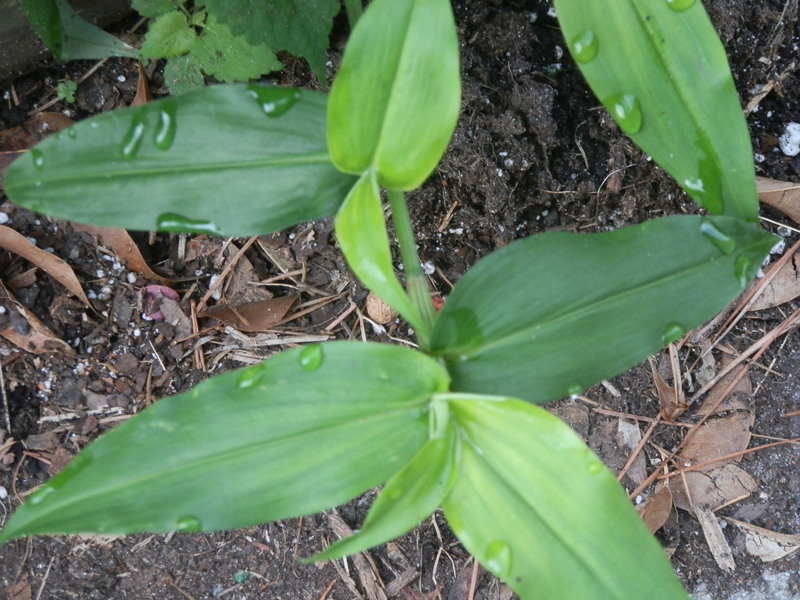 It has short leaves two or three inches long on creeping stems. Leaves clasp the stems and often hair-like tissue resides in this area. When stems contact the ground roots form profusely where leaves emerge from the stems. Plants rarely grow much more than two feet tall. That’s one reason it often remains somewhat camouflaged. Deer-tongue grass is another species some confuse with it when plants are young, but once the blue flowers emerge identification is simple. Dayflower is a hardy annual or tender perennial, meaning that controlling it is usually predicated on keeping it from going to seed. Quite often parent plants don’t survive substantial winters unlike its cultivated more compact cousin, widow’s tears. Dayflower grows well in wet shady areas or sunny places, especially if shrubs or other plants are present. Dayflower looks harmless and delicate, but it can be an invasive weed. Few chemicals are effective against it either, and none that I’m aware can be purchased without a pesticide license. Unless plants are very young, Round-up isn’t effective within recommended rates even with multiple applications. Treatments with it merely endanger your desired plants. Hand weeding is your only decent option. Don’t discard those invasive devils. The leaves are edible and mild tasting. I like them better lightly cooked with butter and salt, but they can be used in salads. They don’t get strong as the season progresses, but the stems become tough, so discard them. Leaves are oxalate accumulators, so don’t eat too many and be sure to cook them if you form kidney stones. I hear the seeds are edible, the flowers too, but I’ve never fooled with them. The flowers can be used to make a bright blue ink. The blue colorant in the dye is a chemical called commelinin, interesting since the genus name of dayflower is Commelina. This dye, extracted extensively in Japan, fades when exposed to prolonged sunlight. Dayflower is prescribed medicinally by herbalists to treat sore throats and tonsillitis. Since it is a diuretic it has been used to treat urinary ailments. Plant sap has styptic properties similar to those of plantains, yarrow and other wild herbs. Extracts also show antibacterial activity. 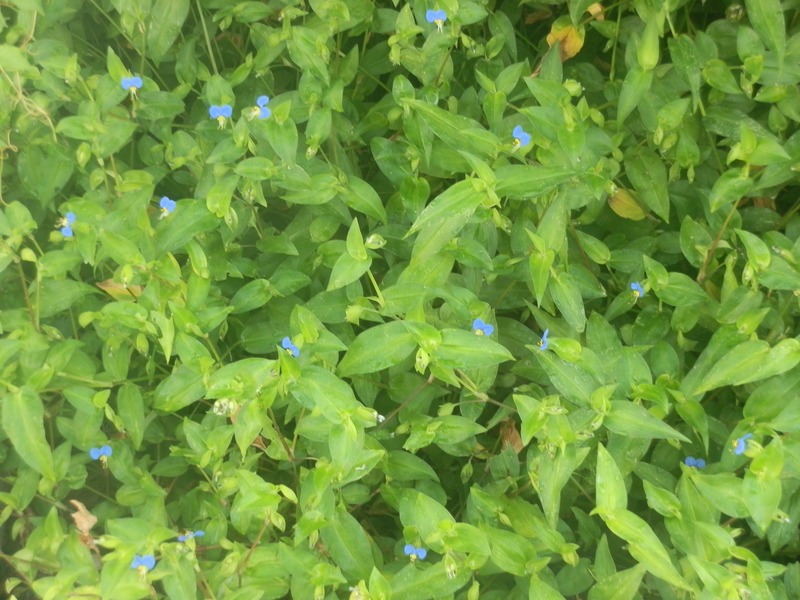 Research is presently being conducted on the use of dayflower extracts to treat type-2 diabetes. These plants contain alpha-Glucosidase inhibitors, which interfere with the breakdown of complex carbohydrates and formation of sugars. In short, they slow down starches from turning to sugars and keep too much blood sugar from entering the bloodstream. This could also help with obesity problems. Research is in its infancy, but it has potential. This entry was posted in foraging and tagged alpha-glucosidase inhibitor, antibacterial, blue flowers, commelin, Commelina, dayflower, edible, foraging, nature, sore throat, styptic, tonsillitis, wandering jew. Bookmark the permalink. Commelina cyanea here in eastern Australia(pretty much identical to your pictures) is called ‘scurvy weed’ because of the role that it had as a fresh green for the first Europeans (convicts and troops) arriving in Sydney from 1788, plagued by that famous problem of early sailors’ diets. It is now pretty much a forgotten food. seen many of these flowers before. its also interesting that it helps treat type 2 diabetes. This is a beautiful flower which is very useful in helping prevent obesity and helps with type 2 diabetes. These flowers are also beautiful. I lvoe that this helps with diabetes most of my family has diabetes. this plant isnt very eye catching but is an interesting plant and has amazing medical benifits. Seen this outside by the trees ! It’s soooooo beautiful ! This is a really cool plant in many ways. Medically its amazing that it help treats diabetes and help with obesity, also its cool how you use the flower to make a bright blue dye. I believe I hade to pull those out of my moms garden before. Never knew that most weed killing substances wouldn’t kill it though, or that it can be used as medicine for soar throats. i see these all the time you have talked about them in class and i think its cool how it helps treat type 2 diabetes.